ST. GEORGE — In light of a measles outbreak in Washington state and a case of mumps at a St. George elementary school, health departments are encouraging anyone who hasn’t received a measles, mumps and rubella – or MMR – vaccine to do so. These diseases, once declared eradicated in the U.S., have made a small comeback in recent years as the number of people being vaccinated has slightly declined nationally, said David Blodgett, director of the Southwest Utah Public Health Department. Washington has declared a statewide public health emergency after an outbreak of 37 measles cases. “Any time there’s a vaccine preventable disease we are very concerned, because they’re diseases that don’t need to happen if people are properly vaccinated,” Blodgett said. Parents of children attending Sunset Elementary School were sent a letter from SWUPHD warning them to watch for symptoms of mumps in their children after a student stayed home sick with the disease Jan. 15, exposing teachers and others students up to three days prior to that. “This child was out as soon as they were symptomatic, so they weren’t in the school at all when they had symptoms which was good,” Blodgett said. Those who have mumps typically have symptoms such as fever, headache, muscle aches, fatigue, loss of appetite and, most commonly, swelling and tenderness of the salivary glands under the ears, resulting in puffy cheeks and a swollen jaw, according to the Centers for Disease Control and Prevention. Mumps is transmitted through saliva and can be spread when an infected person coughs, sneezes, talks or shares utensils or drinks. It has a long incubation period, and a person can be infected 12-25 days before showing any symptoms. Most people with mumps recover completely on their own within a few weeks. However, in some cases complications such as encephalitis – inflammation of the brain – can occur, as well as inflammation of testicles or ovaries, meningitis or deafness. “In the case of mumps, really the only weapon you have to stop the spread of mumps is vaccination. … So that’s our recommendation. Please get vaccinated if you haven’t been,” Blodgett said. While a mumps outbreak can be difficult to control since the incubation period is so long, measles, which is extremely contagious, is worse. “Measles is the hardest one because it’s so easily spread and has a much higher rate of severe complications,” Blodgett said. There have been no reported cases of measles in Utah recently, but the statewide public health emergency in Washington has raised concern in local officials who are closely monitoring the area. “Big outbreaks going on in the country, so we may see one. We’re being diligent and watching for it,” Blodgett said. Symptoms of measles begin with a fever, cough, runny nose and watery eyes, according to the CDC. Two to three days after the first symptoms, little white spots appear inside the mouth. After three to five days, the infected person will break out with a rash of little red spots or bumps which starts on the face and spreads down the body. 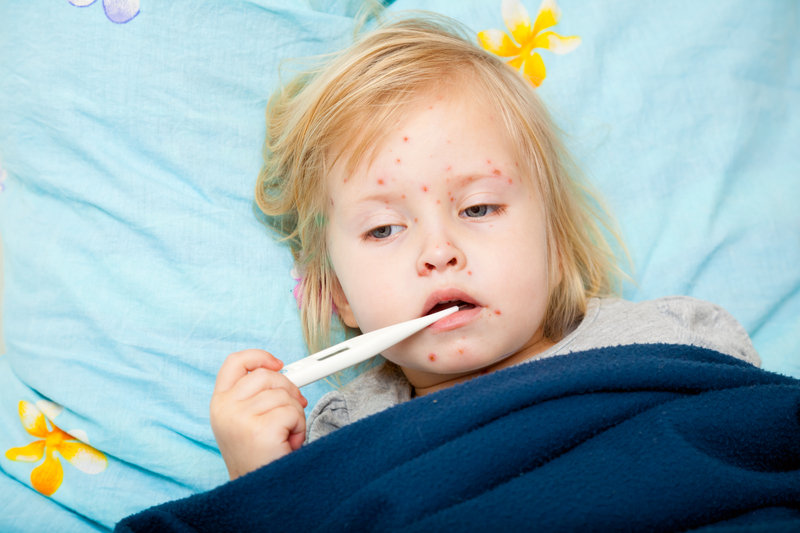 Complications are more common with measles and are even more common in children under 5 and adults over 20 years old. One in 10 people who get the measles will have either diarrhea or ear infections that can lead to deafness in at least one ear. More severe complications include pneumonia, which is the most common cause of death in children with measles and affects 1 in 20, or brain swelling, which can lead to deafness or intellectual disabilities. About one or two children that contract measles out of 1,000 will die from it, and around 1 in 4 people with measles will require hospitalization. Controlling measles is difficult because it is highly contagious and spreads through coughing or sneezing and can live for up to two hours in the airspace where an infected person coughed or sneezed. Then if someone else breathes the contaminated air or touches a contaminated surface and then touches their face, they can become infected. It is so contagious that 90 percent of unvaccinated people who are around an infected person will get measles too. Once again, the best protection against measles is the MMR vaccine. The vaccine is typically given to children in two doses, one at 1 years old and the second between 4 and 6 years old. The full dose is about 97 percent effective at preventing the disease. Those at high risk may be recommended a third dose. There have been no recent cases of rubella in Utah, which is extremely rare in the U.S. Rubella causes fever, headache, cough, runny nose, pink eye, swollen lymph nodes and a rash, as well as serious complications in pregnant women such as miscarriage, stillbirth or serious birth defects, specifically Congenital Rubella Syndrome (CRS). Women infected with rubella during their first three months of pregnancy have a 90 percent chance of giving birth to a baby with CRS, or losing the baby. Most people who contract measles, mumps or rubella catch it while traveling internationally to countries with limited access to the vaccine, then bring it back to the U.S. It is extremely important to be vaccinated against these diseases, Blodgett said, not only for personal protection but for the protection of others, since there are some people who are immunocompromised or the vaccine simply doesn’t work in for some reason. “When we start talking population based-health – which is what we do, prevention – the reason that you want everybody to be vaccinated is so you can achieve what’s called herd immunity, where the disease won’t spread in the community because there’s enough people that are vaccinated that it doesn’t have anybody to spread to,” Blodgett said. For those who have never received one, MMR vaccines and vaccines for other diseases are available at SWUPHD clinics in all five counties in the district. More information about immunizations offered, locations and contact information can be found online.